The actress Lola Chlud visited the secondary school in Linz which she finished in 1926. She made her stage debut at the theater of Teplitz-Schönau before she went the the German Theater in Prague where she soon became a demanded stage actress. 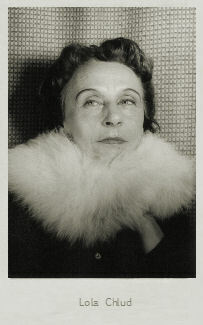 In the next years she was engaged at different theaters, among them at the Lobetheater in Breslau from 1929 to 1930 (one of her directors was Max Ophüls), at the Künstlertheater in Berlin from 1930 to 1931, at the Volkstheater Wien from 1931 to 1933, at the Schauspielhaus Königsberg from 1933 to1934 and after a guest performance at the Volkstheater in Vienna followed appearances at the Neuen Münchner Kammerspielen from 1934 to 1936. After her marriage with the engineer Friedrich Heumann in 1936 her engagements diminished and she only appeared occassionally on stage, among others in Metz, Bremen and Königsberg, where she lived after her marriage. She continued her stage career after the war and played at theaters in Gera (1945-1949), Dresden (1949-1952), Leipzig (1952-1956), Lübeck (1956-1965) and Hannover. She remained active as a stage actress till 1986. Lola Chlud was also able to gain a foothold in the film business of the 30s, she made her screen debut with "Panik in Chicago" (31). In the next years followed movie productions like "Der junge Baron Neuhaus" (34), "Die Heilige und ihr Narr" (35) and "Die Drei um Christine" (36). Afterwards she concentrated to the stage again, only from 1952 she acted again in front of the camera for "Frauenschicksale" (52). Her movie appearances remained seldom after that and in later years she worked exclusively for television beside the theater. To these productions belong "Der Fall Harry Domela" (65), "Die Dame vom Maxim" (69) and "Heimkehr nach Deutschland" (82). A bit thank goes to Mr. Jens Heumann (Son of Lola Chlud) for additional information.